Strong performances and a chilling atmosphere uplift what is otherwise a disappointing and generic horror flick. There’s one thing that most people can seem to agree on – casual readers, fans, and even Stephen King himself – and that’s that Pet Sematary is his darkest and most upsetting work of fiction. Having just read the novel myself, I also hold this opinion. However, I also think it’s one of his best; a terrifying and gruelling read for certain, but one with a thrilling depiction of morality and grief. Now, when it comes to filmic adaptations of King’s work, opinions can wildly differ. For example, I much prefer the 2017 adaptation of It to the bloated, 1700-page monstrosity of the book. When I heard that Pet Sematary was the next of King’s works to be adapted, I was deeply curious to see how the filmmakers would go about recreating the source material; and indeed, whether they actually would at all. The film’s official trailer already gave away a crucial plot differentiation, but since King himself defended the change it didn’t concern me too heavily. So, how does Pet Sematary measure up. Unfortunately, the end product is just the tiniest bit undercooked – perhaps it should have stayed buried just a little longer? The essence of the story is all there – the titular ominous graveyard, the Monkey’s Paw-esque domino chain of bad luck and the creepy rural setting. But it all lacks in depth, unfortunately, which no amount of lame jump scares can fix. None of the book’s creeping sense of dread and inevitability makes the jump – the lead character, Louis Creed (played effortlessly by an always-dependable Jason Clarke) is introduced to the Native Indian burial ground beyond the Pet Sematary far too quickly. The reveal of the mysterious Little God Swamp that possesses the power to resurrect the dead is built up well enough but the idea that the land has a mystical sway over all those who know of it isn’t really presented well. Jud Crandall (a warm but underdeveloped John Lithgow) isn’t built up as a character sufficiently to make his ill-fated decision to lead Louis beyond the woods an impactful one. Instead he just comes across like a moron when, with full knowledge of the disastrous effects of resurrection, he casually suggests burying the family’s dead cat Church in the grounds. Cue a ‘shocked Pikachu’ face a few scenes later when it’s revealed that the zombified moggy has turned mean. The performances are generally excellent, which is a saving grace. Amy Seimetz as Rachel Creed is a surprising highlight, with a performance that really sells every squirm and frown. That said, the backstory with her sister Zelda – whilst haunting and grotesque in the spirit of the book – ended up taking up space in the runtime that might’ve been better spent building up the mystery of the titular burial ground. Jete Laurence is fantastic as Ellie Creed, who can make a convincing snap change from cute and endearing to chilling and inhuman at any given moment. The crew also did a great job with creating Church, the family’s zombie cat who serves as an introduction to the mystical power of the burial grounds. A chilling presence that can elicit a deep sense of unnerving as it creeps from corner to corner and generally emanates malevolence, Church is a brilliantly subtle creation that the film really could have used more of. Thematically is where the film falls down, unfortunately. There isn’t nearly enough of the book’s fearless discussion of the ‘final taboo’ that is death. There should’ve been far more of a visual dissonance between the Pet Sematary and the burial grounds, and Louis needed far more of a dialogue (whether that be internal or with Jud/Rachel) on the consequences of using the burial grounds to resurrect his dead child. The film doesn’t allow any time for the grief to really sink in and eat away at Louis, which is a shame because Jason Clarke is more than strong enough of an actor to sell that heart-breaking transformation from perfect sanity to raving lunacy. As a result, when Jon Lithgow’s Jud utters the infamous ‘Sometimes dead is better’ line, it feels entirely unearned. 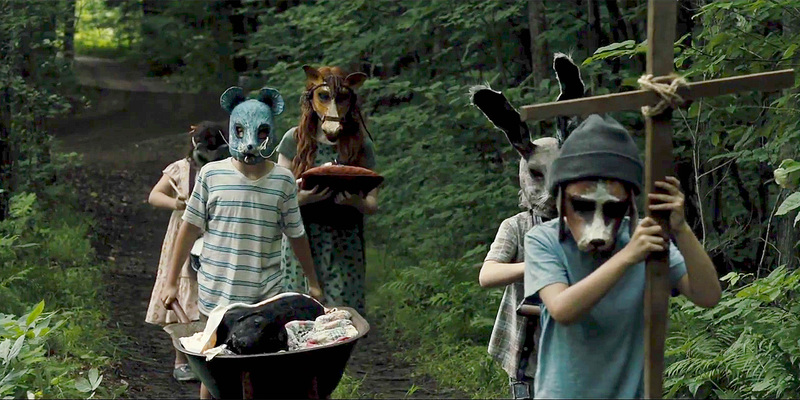 On another point, the creepy funeral procession motif is startlingly underused; the addition of the mask-wearing children was one of the few alterations which made the material stronger, in my view. However, once we see them in the film’s opening scenes, they are never seen again, which is strange considering how important they are to the marketing campaign. A final point of contention is the film’s ending, which takes a massive U-turn from the book. The most upsetting part of the original source material is where Louis is forced to reap what he has sown, and kill his undead child for the second time. But that moment never comes in the adaptation, which instead vouches for a generic ‘everyone dies’ ending. What could have potentially been a haunting final shot is ruined by a terrible, misjudged end credits song, Starcrawler’s cover of The Ramones’ ‘Pet Sematary’ (ooh, how inventive). Overall, the overriding sense that I had walking out of Pet Sematary was that of a missed opportunity. The film got so many things nearly right that it makes the parts it falls down on even more disappointing. That said, if you’ve never read Stephen King’s original book or you’re less worried about faithful adaptation, you’ll most likely have a great time at Pet Sematary. If you’re looking for something more thoughtful, emotional and disturbing, you might want to look elsewhere. Pet Sematary, directed by Kevin Kolsch and Dennis Widmyer, is distributed in the UK by Paramount Pictures, certificate 15.